Below are some examples of how your registration should be spaced to be legal. There should be an 11mm space between characters and 33mm gap between the groups of characters in the registration. When you enter your registration enter the space with the keyboard to achieve this. More than 1 space between the two groups. Additional spacing added making more than two groups. These are only examples – not a complete list spacing options. For a plate to be legal it has to be spaced correctly and use the correct legal items on the plate. On our website everything is for legal plates only. There are 4 legal fonts. The only legal graphics are listed in the Legal side badge dropdown box, in addition you are allowed a border. 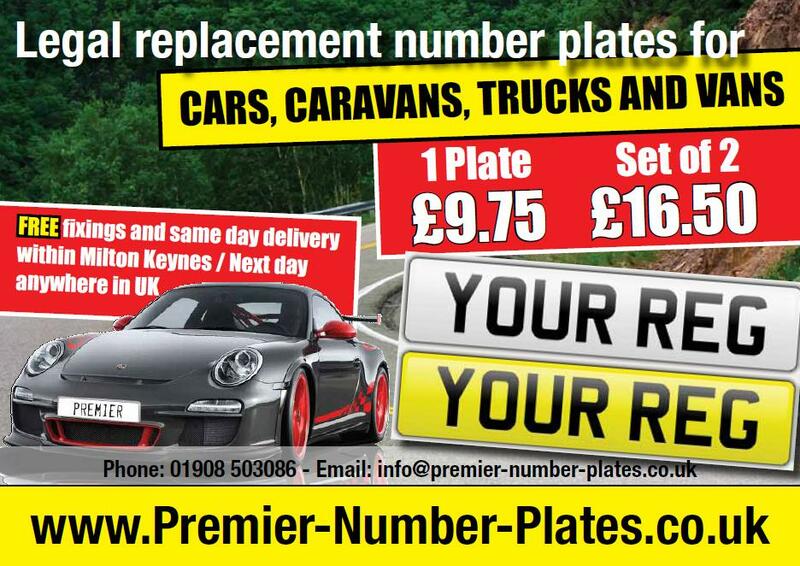 All our plates are made to British Standard and we will include the BSAU145d number and our name and postcode on the plates discreetly. Please see following for further information – download a document to show this. This is a border line around the outside of the plate and it is legal if you wish to include in any colour on your plate. There are 3 legal fonts Legal Standard, Legal 3D, and Legal Hi-line. These are the side badges deemed to be legal for road use. For Example you may wish to display the Euro symbol and GB national identifier on the number plate. This will dispense with the need for a separate GB sticker when travelling within the EU.